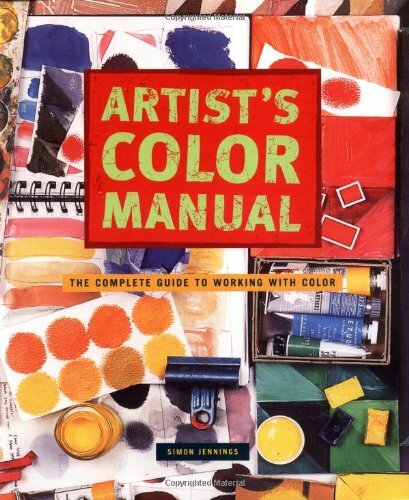 Artist's Color Manual is an enlightening and educational book that I can recommend to all artists. It's a wonderful reference for colours. Right after the contents page, author Simon Jennings shows off pages from his journals filled with colour swatches, mixes and experimentation. A lot of time and effort is spent not just on observing hands on, but also on research as there are lots of wonderful examples and pictures included throughout the book. There are only three chapters in this 192-page paperback. The first chapter covers the history, medium, and other aspects of colours such as the colour wheel, choosing a palette, the science behind colour mixing, and more. The book talks about different medium but there's no specific focus on any which is fine because this is a book on colours. If you only specialise in one medium, you'll learn more about others and it can be quite interesting. The second chapter looks at colours one by one. Each colour has its history and significance explained, and where the pigments come from. The last chapter talks about the creative usage. It's a bit random here. Some topics include subdued colours, working without black, Renaissance skin tones, using a limited colour palette, using coloured-paper pulp for art and more. It even talks about colouring of cel paintings in animation. There's a lot of interesting things to read. There is a colour chart at the end of the book with each main colour picked out and four swatches are made from four different brands. Throughout the book, there are different brands mentioned but no emphasis on any particular one. What's missing from the book is perhaps colour mixes. It does talk a bit about colour mixes for selected colours, but you won't see neat tables of colour mixes. Anyway, Colour mixing books are easy to find. This book is very nicely laid out. While there's a lot to read, the multi-column layout of the pages makes everything easy to read. There are also more than 1000 illustrations, photographs and swatches accompanying the text. It's a wonderful visual guide to colours. Highly recommended to all artists.